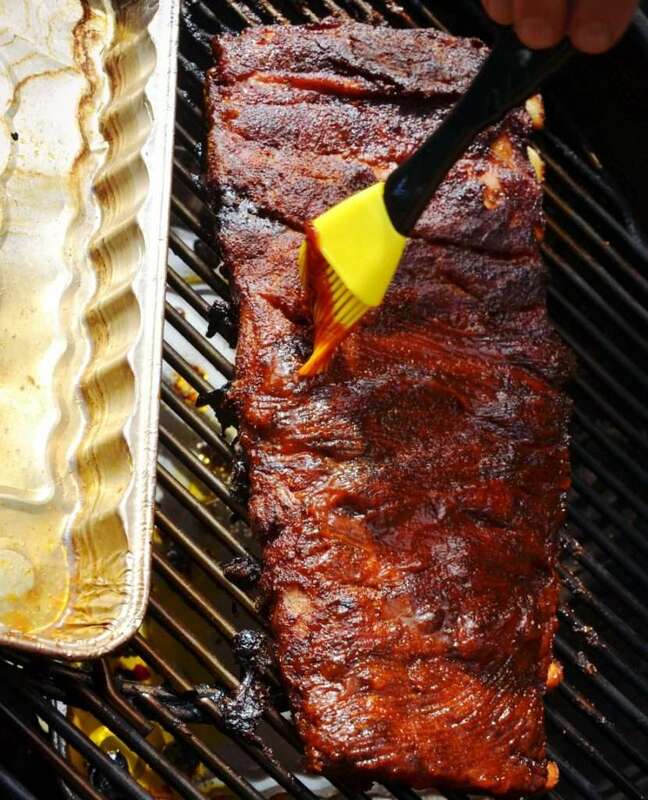 The explosion in the popularity of barbecue and all those shows about barbecue competitions might have you believing that you need a big, expensive smoker to make great barbecue ribs. The truth is, you don’t. While very good barbecue ribs can actually be made on a Gas Grill the best piece of equipment to prepare a rack or two of great ribs, is a charcoal grill. Of course, it must be a full-sized charcoal grill with a lid and good airflow control, but if it is, it can be set up to do some excellent, low and slow barbecue. The trick is to convert the grill into a mini water smoker and all you really need is a couple of disposable aluminum pans, some wood for smoking and a rack or two of ribs. To accomplish this your charcoal grill must reliably hold low temperatures for long periods of time. While most can, some can not. You need to determine if yours is the kind that can. To test it, build a fire in your grill and adjust the vents so that the internal temperature of the grill stays stead at a temperature around 250 degrees F (120 degrees C). The grill will need to hold this temperature for at least four hours. It may be necessary to add additional fuel to the grill during the cooking process. We will discuss that later. 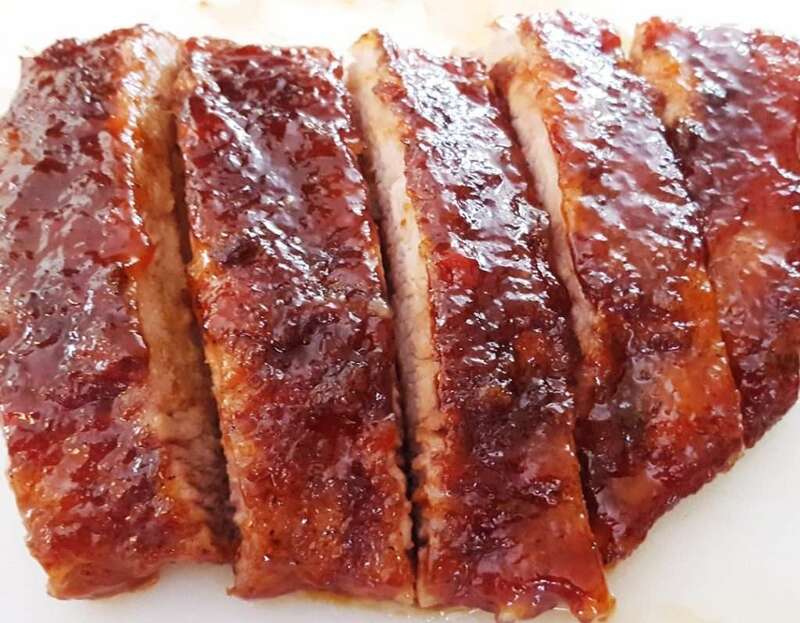 The grill must also be large enough that a rack of ribs can sit on half the cooking surface and have room around the edges for airflow and smoke. The ribs used for this method can be spare ribs or baby back ribs. Spare Ribs are larger and will take up to 5 hours to cook. Baby Back ribs will take about 4 hours. If you choose to do more than one rack of ribs, the grill must be large enough to accommodate both racks. There are rib holding racks available with allow multiple racks of ribs to stand on their sides, making more room. The average charcoal grill might be able to accommodate three, even four racks with one of these. The ideal rack of ribs is in thickness and width with a uniform rectangular shape. 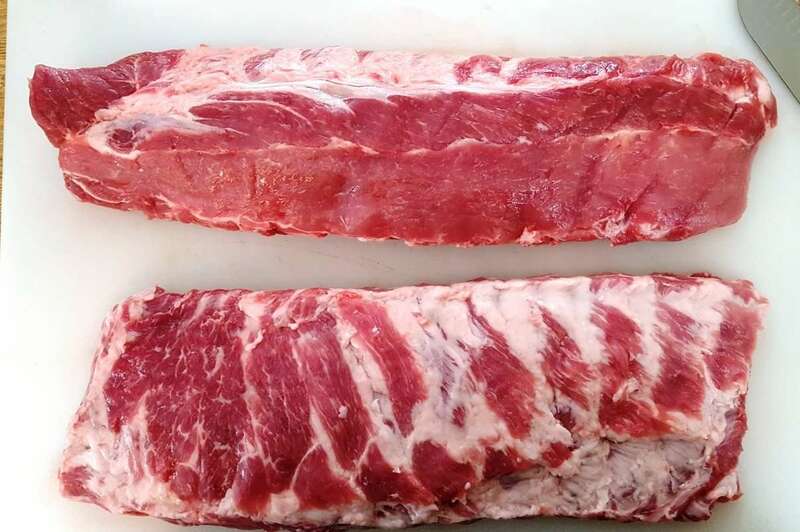 Look for this shape when buying ribs. 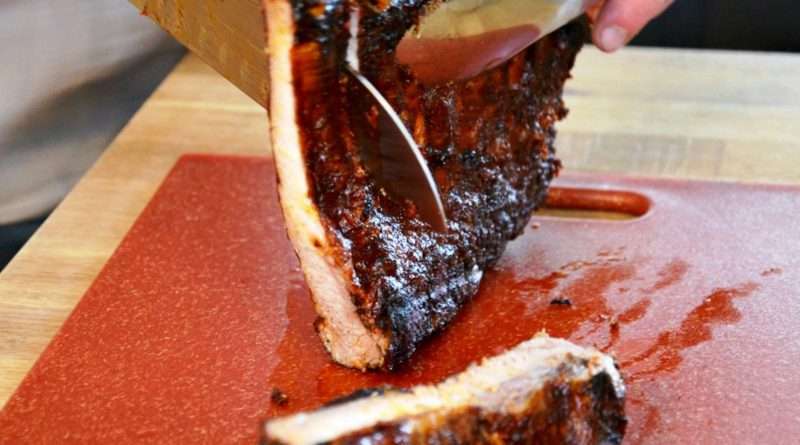 Before a rack of ribs is cooked, it should be trimmed of any excessive pockets of fat. There is plenty of fat marbled into the meat to keep the ribs moist while it cooks. heavy layers of fat will produce a greasy rib. Also, trim away any loose pieces since they will simply dry out on the grill. Once the surface trimming is done, turn the ribs bone side up and remove the membrane that covers the bones. Cooked, the membrane will be tough and it also prevents flavor from getting into the meat. The best method for removing the membrane is to use a blunt knife, like a butter knife. Lift away the membrane on one end of the rack and grab it with a paper towel. The membrane is slippery, but the paper towel allows for a good grip. Now, gently pull the membrane away. It might take a few attempts to get all of it, but with a little practice, it becomes easy. To get the right flavor for your ribs, start with a good BBQ Rib Rub. Whatever flavor profile you like is perfect, but the rub is vital to getting what we expect a rib to taste and look like. BBQ Rubs are typically loaded with spices and herbs, but especially paprika. The paprika helps to build the right color for barbecue ribs. 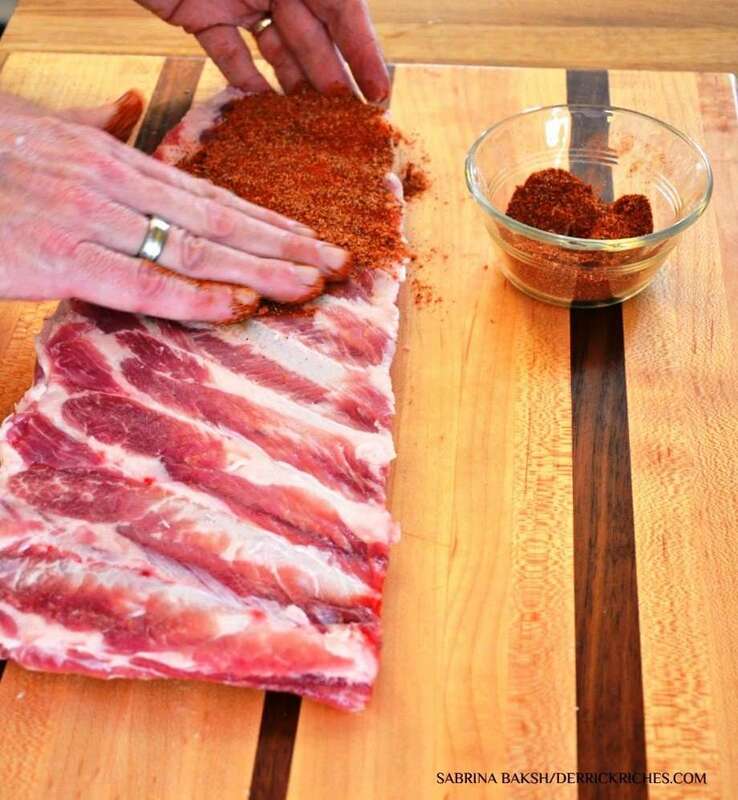 When it comes to applying the rub to the ribs, the general rule is what sticks is the amount you need. Before applying the rub, make sure to pat dry the rack with a paper towel. The natural moisture of the meat will hold the right amount of rub in place. Coat the meat side well. A light dusting on the bone side is sufficient since not a lot of flavor is going to penetrate from this side anyway. Once the ribs are well coated handle them gently to keep the rub in place. This step can be done several hours in advance to allow the rub to penetrate deeper. 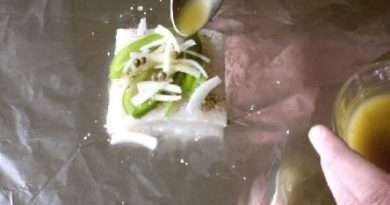 If you wish to do this, wrap the rubbed ribs with plastic wrap and place in the refrigerator until about 30 minutes before you are going to cook them. It isn’t necessary to do this, but there are people who swear by an early seasoning. 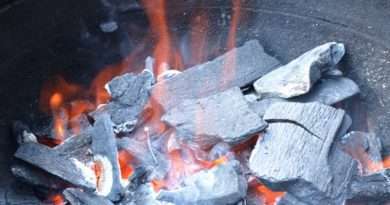 To set up the charcoal grill for smoking you are going to need the grill to be clean, enough burning charcoal to cover half the coal grate and the two disposable aluminum pans. Start by removing the cooking grate from the grill. Place one of the aluminum pans on the coal grate. If your grill is round, it might be necessary to bend the pan to fit. It should cover exactly half the coal grate. Place the burning charcoal (ideally from a charcoal chimney) on the coal grate next to the pan. Spread it out evenly. The coals should be about three layers deep. Place the wood chunks onto of the burning charcoal and replace the cooking grate. 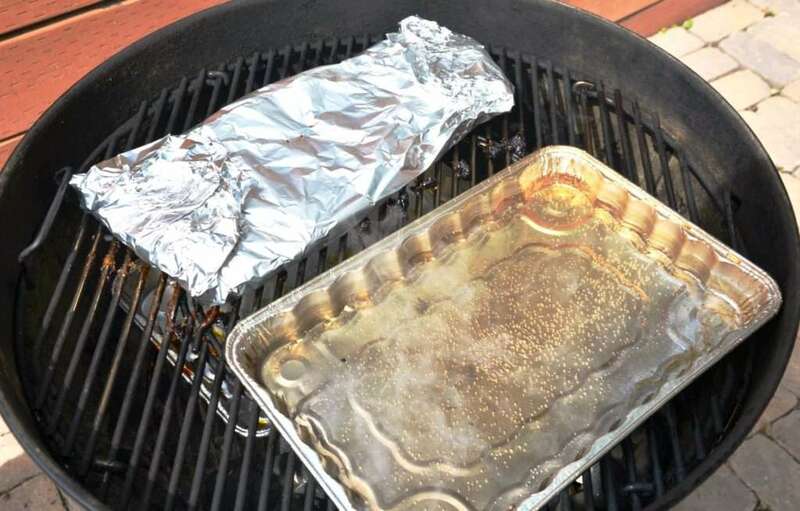 Place the second aluminum pan on the cooking grate directly over the burning coals and carefully pour in enough warm water to nearly fill the pan. The water should spill over the side, but the more hot water the better. The water produces steam to keep the cooking environment moist and it acts to regulate the temperature by holding the heat steady. With the water pan filled, put the lid back on the grill and adjust the vents to hold a consistent and low temperature (around 250 degrees F/120 C). The water will steam away slowly and you shouldn’t need to add more water, but keep an eye on it. With this configuration, your charcoal grill is now a smoker. Now that the charcoal grill is configured for smoking and holding the right temperature it is time to put on the ribs. 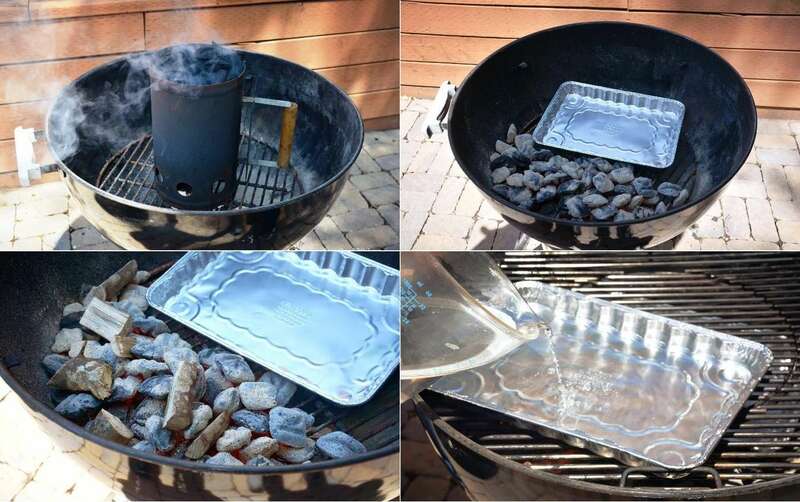 Place them directly over the aluminum pan that is sitting on the coal grate. There should be good airflow all around the ribs so that smoke and heat can get to them evenly. During the cooking process, it will be necessary to rotate the ribs since one side is closer to the fire than the other. The rack should be placed bone side down next to the water pan. No part of the rack should be directly over the fire. To get the ribs to tender perfection will take about 4 to 5 hours depending on the grill, weather, and the racks themselves. They should be monitored, but lift the lid as little as possible. You want to hold in the heat and the smoke and keep it consistent. Will be looking for a temperature around 185 to 190 degrees F (88 to 90 degrees C) before the ribs are done. At this temperature, the ribs will have their maximum tenderness before the meat starts falling off the bone. Remember that a great rib has a bone in it and doesn’t fall into a pile of meat when it comes time to eat it. That whole “falling off the bone” thing was created by bad restaurants that boil ribs. Once the ribs have been on the grill for an hour it is time to check on them. Make sure that the temperature is holding steady, that the fire is still burning, and that there is plenty of water in the water pan. At this time, add additional hardwood to the fire to continue the smoke production. Barbecue ribs should have a good, but not an overly heavy flavor of smoke. The ribs themselves should be browning. The meat should be soft and slightly damp in appearance. Check for any signs of burning. At this time, rotate the ribs, keeping them bone side down, but exposing the other side of the rack to the heat. After another hour, wrap the ribs in a double layer of heavy aluminum foil. It should be as airtight as possible. This wrapping holds in moisture and helps to bring the internal temperature of the ribs up. When you pick up the ribs to place them on the foil they should curve nicely, but not fold. If they are still and appear raw in any place, leave them on the grill for an additional 30 minutes. Check to make sure that the temperature is correct. If the ribs appear to be cooking well, place the wrapped ribs back on the grill, rotating them again as you do. Check the fire and the water pan. There is no need to add additional wood chunks at this time since the smoke won’t be able to reach the ribs. The ribs have absorbed all the smoke they are going to get. Allow the ribs to continue cooking for another hour. The ribs have now been on the grill for at least 3 hours. Technically speaking, they are cooked. They are not barbecue yet, though. Remove the ribs from the foil and place them back on the grill, rotating them again as you do so. Again, check to make sure that the fire is still strong and that the is water in the water pan. If the grill needs additional fuel, add it now. It isn’t important to add additional smoking wood, but the temperature needs to remain strong to finish the ribs. 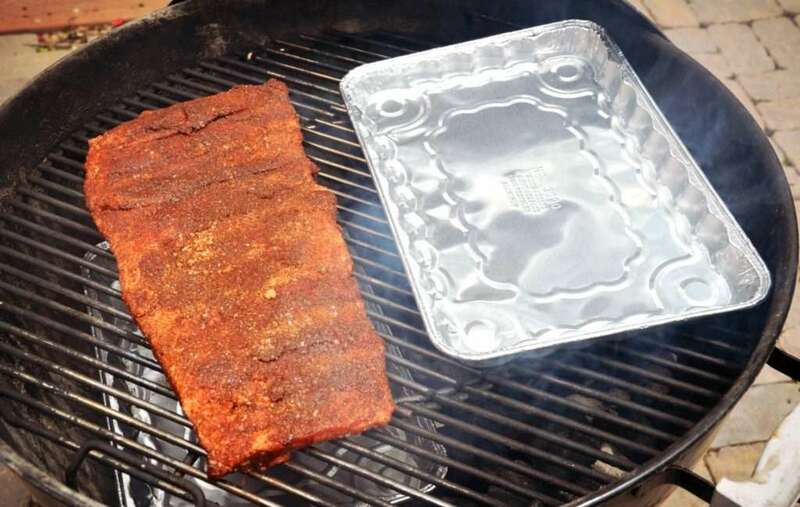 Since the rack has been wrapped in foil, the ribs should appear wet. They should bend easily, but not fold. If the bones are loose or the rack folds in the middle it is time to take them off the grill. Otherwise, continued cooking. You can test the temperature of the ribs with a good meat thermometer. Unfortunately, with ribs, this can be a challenge. Remember that the ribs will be done at a temperature of 185 to 190 degrees F (88 to 90 degrees C). The bone will be a different temperature from the meat and to get an accurate read you will need to check the meat without getting the thermometer too close to the bone. Test in several locations. If the grill temperature has been correct, the ribs should need another 30 minutes to an hour to reach perfection. Close the lid and continued cooking until they reach the right temperature. Once the ribs reach the right level of doneness they can be removed from the grill. 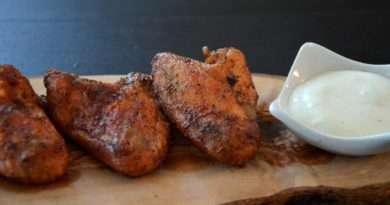 If you want to add barbecue sauce read on. When the ribs are nearly done it is time to slather on the barbecue sauce (if you intend to sauce your ribs). This should be done in thin layers and the barbecue sauce should be warm. By layering on the sauce, you get a sticky surface on the ribs and not a thick wet coating. Start by putting a layer on the ribs and turn them over and coat the other side. Close the grill lid wait about five minutes for the sauce to cook onto the surface. Repeat as many times as desired. I generally do this about 5 times to give the ribs a thick coating. Once the saucing is done, remove the ribs from the grill and place them on a large cutting board. 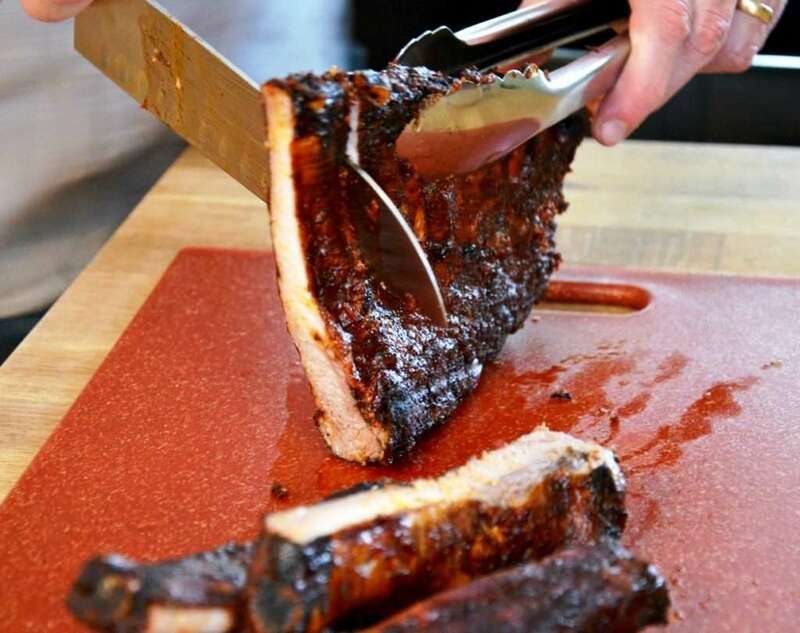 Carving ribs is best done with a long sharp knife and a pair of tongs. Hold the rack on its edge with the bones facing towards you. Slide the knife down, between the bones evenly. By cutting straight down through the rack you can get a good, even cut and a uniform rib. Rib bones tend to turn a little more towards the small end, but with a little practice, you will get the hang of it. There is no need to wait at this point. The ribs can be eaten as soon as they are cut.